The Only One Internet data centre offers a secure, resilient environment for our web hosting platform. 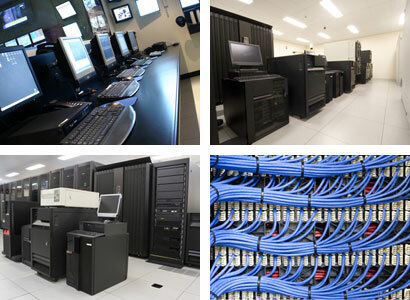 Based in a secure facility the data centre is built to an N+1 specification, so that if any particular service fails - e.g. electricity or air conditioning - another backup service automatically takes over the failed service's job. Dual power feeds enter the building at different points and Uninterruptible Power Supplies (UPS) ensure that all power to the server area is clean and spike free. In the event of a power outage the UPS can take the entire data centre load for up to five minutes. However within 20 seconds our redundant generators are able to indefinitely take on the entire data centre load. Our data centre is manned 24 hours a day, 7 days a week, so that if anything goes wrong engineers can respond quickly and effectively to the problem. Access to our data centre is via a master access list using Smart Card authentication. Access to the data centre is by authorisation only. CCTV operates throughout the facility. The temperature of the data centre is kept at a steady 20oC to allow optimum equipment performance. Our fire detection system monitors the room for any sign of fire and allows operators to respond to such a situation using a variety of fire suppression techniques. Protect your online identity, hide your details in the WHOIS domain name database.